Keratin Fusion Pre-tipped extensions work on any texture of hair and is ideal for slippery hair. These extensions are applied strand by strand, applied with a hot hair extension iron, not a flat iron. Damage free - the keratin melts onto the hair strand with only a few seconds of heat. APPLYING HOT FUSION EXTENSIONS: Shampoo with a clarifying shampoo twice, do not use conditioner and make sure hair is completely dry. Parting the hair horizontally, section off the top portion of hair. Use your clip or comb to create a square section of hair, about 1/4 inch. The thicker the hair, the smaller the section. Apply the extension 1/2 inch away from the scalp. Holding the hair at a 45 degree angle, heat the bond with your hair extension iron until it liquifies, about 2 - 3 seconds. Think of the bond like a small bead, making it no longer than 1/2 inch long. Roll the bond with your fingers and try to make the bond roll around the strand of hair. Make sure it is sealed tightly. HOME CARE: Be sure to educate your client in how to care for her extensions. 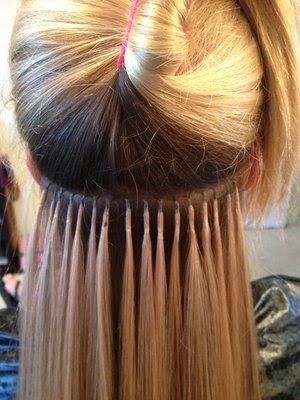 Show her how to section her hair for brushing - This will reduce pulls and snags on the newly bonded extensions. I tipped extensions using micro rings is a strand by strand method of application. These hair extensions come tipped with a shoelace shaped end or I-tip. The application process is the same as keratin fusion but the hair is held in place with a copper micro ring, silicone lined ring or screw micro ring. There is no heat used in this method. APPLYING I TIP EXTENSIONS: Shampoo with a clarifying shampoo twice, do not use conditioner and make sure hair is completely dry. Part hair horizontally and secure the top section with a clip. Insert the pulling needle or hook through the I-tip tube. Create a small section where your first extension will attach, small enough to fit through the tube. Hook the needle into the small section you just made about one inch from the scalp. Pulling the needle towards you while securing the tube with your fingers will slide the small section through the tube. Hold the tube with your fingers 1/2 - 1 inch from the scalp and push the extension upward into the tube. Set the solid end into the bottom of the tube pushing the extension toward the scalp. Using the hair extension pliers, flatten the bottom of the tube to adhere the extension and fuse it to the hair.